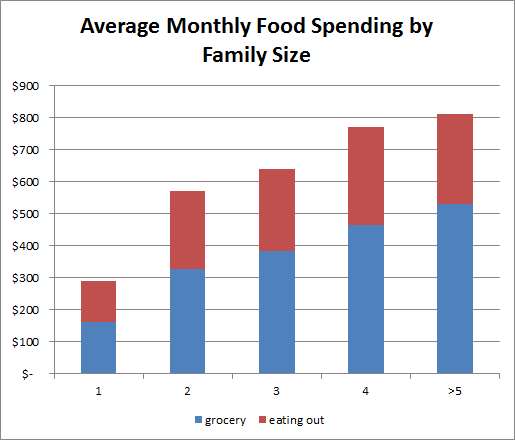 Last year I wrote about Grocery Spending by Income Group. Yeah you guessed it, rich people spend more. Today we'll follow that one up with the sequel and look at how much families spend based on family size. I got the data straight out of the BLS Consumer Expenditure Survey . Specifically the numbers below are from the tables for Size of consumer unit. Pretty obviously, bigger families spend more. But what about the amount spent per person? There the trend reverses and for larger families they spend less per person. I assume this is due to a couple factors. First I'm assuming that the larger the family the more smaller children and I'd assume smaller children consume less food (usually). So a typical family of 4 with 2 little kids isn't going to eat as much per person as 2 adults would. 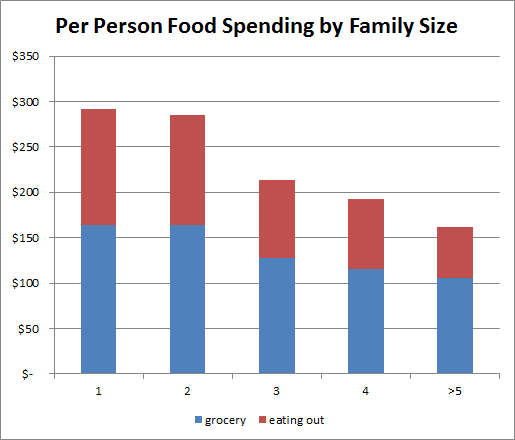 Second I'd also guess that larger families are better at economizing on their food spending due to necessity. Its one thing to splurge on the steak if you're a single person but buying 5 steaks is going to hit your pocket book a lot harder. Electric cars are starting to get affordable. A search on Edmunds shows 4 electric car models under $30,000. However all 4 are in the sub compact class so they're small cars. If you're looking at cars in that class then an electric might make sense. The electric versions have limited driving range but its enough to meet the needs of most people for local city driving. If you then also get the full $7,500 federal tax credit for EV's then that makes the cars fairly affordable. You do have to have $7,500 in taxes paid for the year to get the full credit since the credit is non refundable. But a lot of people don't pay that much in taxes to the IRS so they would not get the full $7,500 in credit. These prices are getting more affordable but they still aren't nearly as cheap as similarly equipped gas cars. The fortwo and Spark have gas equivalents so I can do a rough comparison of costs to buy and pay for fuel between the gas and electric models. In both cases the annual cost is higher for the electric cars if we just look at making payments and fuel costs. My estimates are based on driving 12,000 miles a year, paying 10¢ per kWh and $3.50 for gas. I also figured just making payments and financing over 5 years on 3% loan. Of course you could pay cash up front and then figure the opportunity cost. Given that the electric cars should have higher resale value and lower maintenance costs I'd give the edge to the electric models in both cases. 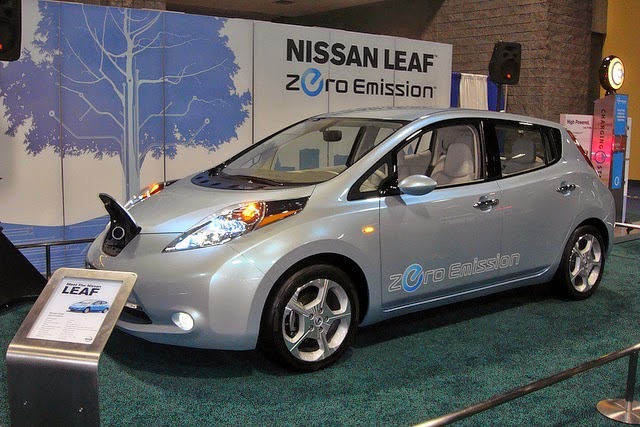 If you happen to live in one of the states like Georgia or Colorado with Colorado with generous tax incentives then it can be a no brainer to get the electric. Retired by 40 shares : I Saved 80% Making Baby Food! DQYDJ asks How Long Should Debt Be a Responsibility? You've probably heard of the Marriage Tax Penalty. Have you heard of the Marriage Tax Bonus? Most married couples receive a Marriage Tax BONUS rather than a penalty. My wife and I pay a lower tax bill then I would pay if I was single. Since my wife doesn't work we get a lower tax rate and higher deduction and exemption. This is generally the case for a married couple with only one income earner. This gives us a Marriage Tax Bonus of several thousand dollars a year. Say you make $50,000 and you're single. Your basic tax bill would be $5,929. If you get married and your spouse does not work then your taxes would be $3,608. The Marriage Tax Bonus is the difference or $2,321. If you make $100,000 then the single filer tax bill would be $18,493 and married would be $11,858. Thats a Marriage Tax Bonus of $6,635. A single income couple is going to cause the largest Marriage Tax Bonus. For married couples with two incomes there may be a bonus or there can be a penalty. It depends on the income levels and resulting tax brackets before and after marriage. "Before the 2001 tax act, married couples were already significantly more likely to get bonuses than penalties. The Congressional Budget Office estimated that 51 percent of married couples received marriage bonuses totaling nearly $33 billion in 1996, and 42 percent incurred marriage penalties totaling almost $29 billion." But note that is before the 2001 tax act. The 2001 tax act changed things to remove the penalty for the lower tax brackets. After that 2001 reform the % of people getting bonuses should be even higher. So now the % of people getting a marriage bonus is above 51%. To roughly figure if you have a Marriage Tax Bonus or a Marriage Tax Penalty you can use the calculator at the Tax Policy Center. I like using photobooks to create physical photo albums of our digital photos. Normally photobooks retail for ~$20-40 for a typical 20 page hardcover book. Through deals on Groupon, Living Social and Amazon Local I've been able to get a dozen photo books for under $7 each on average. The most recent 7 books I've gotten were only $3.29 each on average. It seems there are a lot of companies out there selling photo books on the web and they often have deals. If you go to the daily deal sites (Groupon, Livingsocial and Amazon Local) you can often find a deal on photo books from various merchants. Just search for keyword 'photo' and something may come up. I've gotten the best deals when combined with promotional coupons or credits. I see those kind of randomly from the deal a day sites or 3rd party promotions. To find the deals in general : I've signed up for Groupon, Living Social and Amazon Local. They spam you with email all the time and I don't always read all of it. I also watch Fatwallet.com and Slickdeals.net for good deals. Through the emails or watching the deal sites you should be able to find some bargains. I've also gotten other promo deals like credits or freebies for something like liking a merchant on Facebook. For example on Living Social right now they have a deal for a $11 photo book from York photo. Amazon Local has a $14 photo book from Photobin. Those are OK deals. Do be careful to pay attention to whether or not the deal includes shipping or if shipping is extra. That is a big deal here. Shipping often runs $7-9 or more for these photo books. So for example a $10 photo book at Groupon is really going to cost you $22 with their $11 shipping cost. A different merchant on Groupon is currently offering a $9 photo book with shipping included. Thats a big difference. Another way to save is through the site Gathr.com. I talked about Gathr.com once before. You can get a bundle deal through Gathr.com to combine gift cards/codes. One bundle you could make is $20 to buy a $10 Amazon card, $10 Groupon credit and $10 Livingsocial credit. I could use this deal right now to pay $20 to get a $10 Amazon card which I'd credit to my account and use later on misc. purchases (good as cash as far as I'm concerned), then get $10 Groupon credit to buy a $9 photo book plus a $10 credit on Living Social to get a $11 book for $1 net. In total I'd be spending $20 and getting 2 photo books for $11. That does assume the $10 Amazon card is usable as good as cash, which isn't always the case. I'd basically be spending $11 for 2 photo books. You can even save a little more on top of these deals by buying your deal a day voucher/coupon through Ebates. Right now Ebates gives 3% for Amazon Local, 2% for Livingsocial and 4.6% for Groupon. I wrote Beware Las Vegas Resort Fees about how Vegas hotels charge resort fees a few years ago. At the time not all hotels had resort fees. In fact if my memory is right it seems that a good number of the major casinos did not. But that has changed. Vegas.com has a handy list of all the resort fees. Now its pretty much a given that a Vegas hotel casino will have a resort fee. The charges range from $10 to $25 typically. There are a handful of casinos that do charge less than $10. Silver Nugget is only $5. The average fee is about $17. The only major casinos that don't charge a fee are Four Queens and Fremont. One annoying part about these fees is that they are not included in the booking price of the hotels when you shop for rates. For example if you search on Orbitz you'll get a list of hotels and prices. But the resort fee isn't shown there and you have to click on the 'see details' button for each hotel to actually get the resort fee totals. For example I just did a random search for later in April and Riviera came up at just $15 a night. What a bargain! And only when you go to the 'book room' option do they point out the $15 resort fee which doubles the cost. Each card gives you 25,000 or 30,000 in miles. Most will require you to spend $1000 in the first 3 months and then waive the annual fee in the first year. Alaskas card is different in those respects and gives you the 25k miles up front but does not waive the $75 annual fee. The Delta card is an American Express card, AA is Mastercard and the others are through Visa. United : A roundtrip saver flight in the continental USA is 20-25k points. Southwest : They do not have a fixed amount for a flight but the points cost depends on the flight and has a rough relationship to the dollar value. Points are worth around 1-1.7¢ of airfare each. I can book a couple short flights for the 25k points. Alaska : A roundtrip continental USA flight is 25k /40k. Delta : The cheapest saver flights for continental USA are 12.5k points each way, so minimum spend for a flight is 25k. From what little I've seen of it Delta points seems harder to use. So generally the miles bonuses are worth a round trip in the USA. However how much thats actually worth to you depends on where you want to fly and how much tickets usually cost. For example looking at Alaska flight costs for me range from $138 to $385 if comparing major city destinations on Farecompare.com But they have more limited destinations. Looking at United I see costs ranging from $130 all the way up to $1300. However that $1300 ticket is pretty extreme and more typical costly tickets are in the $600 range. If you live in a bigger city the tickets are not going to be worth as much. If you live in a more remote city like Bismark, ND then tickets could easily be worth $700. A big downside to all these cards are the annual fees that kick in at least in the second year. Paying $75-99 a year is generally not worthwhile unless one of the perks of the card justifies it. Free bags on United alone might pay for their annual fee and the $118 companion ticket on Alaska might justify their $75 fee. Most people are likely better off cancelling the ticket within a year to avoid these fees. How Much Severence Can You Expect If You Lose Your Job? If I lost my job my employer would pay me a severance package. At least that is what they normally do. There is really no promise or guarantee that I'd get severance but whenever I've heard of other people losing their jobs they've gotten severance. In the past the company has had some large lay offs and they shared tables to estimate the severance amount you would get. The severance here works out to roughly 1 week of pay per year of service. 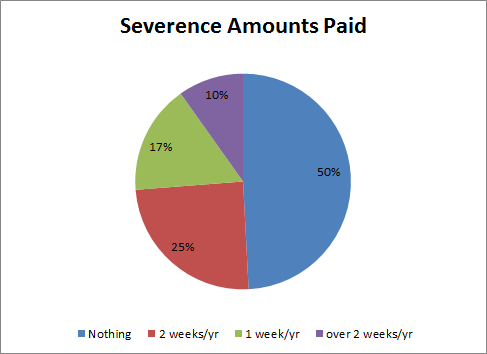 I went out to find data on how much severance companies usually pay. I didn't find a lot of information but I did find a couple sources. This AARP article Read This Before Accepting a Severance Offer claims that "Slightly less than 50 percent of employers provide some amount of severance pay to workers whose employment is terminated." An article in the CNN Money Ask Annie column How Much Severance Pay Can You Expect? says: "about half of employers offering two weeks' salary for each year you've worked there. Slightly more than one in three pay one week's salary per year of service; and fewer than 20% offer less than a year's pay per year of service." Of course this is based on two unattributed data sources and I don't know how accurate either is so it should be taken with a large grain of salt. When you leave an employer you have the right to continue coverage under their health insurance by paying for COBRA. If you leave your employer voluntarily or involuntarily for anything but 'gross misconduct' then you generally qualify for COBRA. For more specifics on how COBRA works see the Dept. of Labors FAQ on COBRA. COBRA premiums can be expensive and people often don't know how much it will cost until they're attempting to sign up. How do you find out how much COBRA costs? I can think if 3 ways to find out how much COBRA costs. 1. First you can simply ask your employer. They should be able to tell you. Your HR department or whoever handles such things should know the premium costs. I'm assuming here but I don't see any reason why they would not know. My employer actually publishes COBRA rates internally and its possible yours does too, especially if you work for a large company like I do. Simply asking your employer is the obvious answer but people may not think of it or they may have a reason for not wanting to ask. For example if you're thinking of leaving your current job for another job you may want to keep that quiet for now. 2. COBRA cost is generally 102% of the actual cost of health insurance. That includes both the employee and employer contributions. If you happen to know the total cost of your health insurance then 102% of that that is how much COBRA will cost as well. 3. Figure the cost based on W2 information and your premiums. Lastly one trick for figuring COBRA cost is to find the employer cost of health insurance on your W2 form. Now the government requires most employers to document the cost of health insurance on the W2 forms. For information on that see the IRS page on reporting of health insurance on W2's. Box 12 DD of the W2 will list the employer contribution. This doesn't count the amount that you as the employee pays and it does not include any HSA contributions. You can figure the total cost of your insurance by adding the amount from box 12DD on the W2 plus your current monthly premiums. So for example say you have a family of 4 and your current premiums are $200. On box 12 DD of your 2013 W2 it lists a cost of $9600. Your annual cost is $200 x 12 months for the employee contribution plus the $9600 for a total of $12,000 or $1000 a month. Your COBRA premiums are likely to be 102% of that or $1020. One of the common themes in personal finance is the idea of cutting cable. Cable is expensive and a luxury expense so its a natural candidate for cost cutting. I've said before that I'm happy to spend a lot of money on cable. We enjoy watching TV and even though it is pricey cable is really a pretty reasonable cost considering the amount of entertainment you can get from it. Even though I have certainly looked at ways to cut that cost by going to cheaper alternatives like Netflix and Hulu. One of the key reasons we don't cut cable is sports. Live sports are hard to find anywhere but cable. Just get an antennae and watch it over the air! Why don't you go to a friends house and watch the game there? I'm sure you can see those games at a local bar. You can use MLB.com or EPSN3 online to see all the games. Now those can all be reasonably good solutions for some people. But they really don't work for me or a lot of other sports fans. My wife and I watch two teams : a football team and a basketball team. The football team has 13 games a year and basket ball is 82 or more. Over the air - We could actually see 2 football games & 18 basketball games on the local networks over the air. Thats actually quite a lot of games. However I'd be missing 11 football games and 64 basketball games. Friends house - Its an imposition on my friends. I don't always want to spend evenings and afternoons at a friends house away from my own home to catch games. While I certainly do find watching sports with my friends its not always convenient and sometimes I simply prefer to stay in the comfort of my own home. None of my friends are basketball fans so theres nowhere to watch those games. Its also not totally free. I'd have to travel to my friends house and to be a good guest I should bring snacks and/or beverage. Local bars - I could absolutely see every basketball game at a local bar. My football team is not a local team and doesn't get much if any playtime in local bars. Bars generally expect you to spend money so I'd have to buy stuff. Bars are not always convenient or comfortable. I'd also have to travel to the bar and back which is extra time. This is not a free option. If I spend just $3 per game on a beverage to watch 64 games then thats $192. If I travel 10 minutes to the bar each way then that ads up to 21 hours of travel time. At $10 an hour thats $210. Gasoline would cost me about $90 in total, not to mention the wear and tear on my car. Altogether I'd be spending $300 - $500 in time and money to go to a bar and watch the 64 games. Online games - There are NO ways to see our teams online. None. Trust me on this.. Yes you can often view many sports teams online, but our teams are simply not online. NBA league pass online version would work if we weren't in the local market but since we watch the local team we can not see our games online. My football team has no online viewing options. If online options were available they generally wouldn't be free. NBA's online pass is $65. Honestly I could watch games over the air, impose on my friend to watch football at his house then spend dozens of evenings sitting in a bar nursing a drink like a cheapskate and catch all the games for our teams. But I do not want to. I decided to buy a Groupon deal today and I shopped around the different rebate sites I've used to see which had the best rebate for Groupon. Turns out the winner was Discover card. I decided to do a quick sample of major retailers to see where the best rebates were. For Citi, Discover & Chase you need to have credit cards with those companies to use their online discount sites. For Ebates & Fatwallet anyone can sign up on those sites. I found a list of the largest retailers in the US and grabbed the top few stores excluding grocery. Each of the sites has several dozen if not hundreds of merchants signed up so thats way too much work for me to sort through and list all of them. Discover is the clear winner with only a few exceptions. 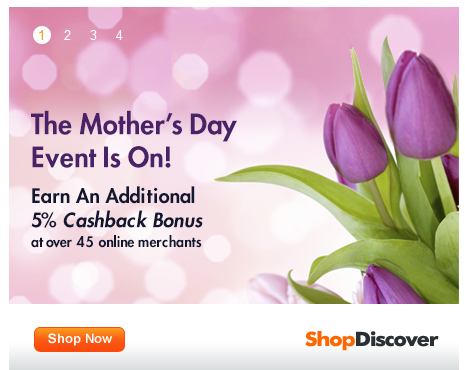 7.5 of the 12 merchants have the largest rebate at Discover. FatWallet has 2, Ebates got 1.5 and Citi and Chase only share the last 1. Note: the rates above are what I found at the time of writing. The rates do change and each site might run temporary bonus offers. One thing to keep in mind is that with Citi, Chase and Discover the bonus above stacks with their normal cashback amount. Ebates and Fatwallet would also stack with the normal cash back on whatever credit card you use. Sometimes the way this stacks can change the better choice. For example, right now Citi has 5% discount at Macy's. So stacking their 3% bonus above with the promo 5% rate makes them 8% and they win right now due to the extra cash back 5% promotion. An article carried on Yahoo talked about How much does a wedding proposal cost at a major league ballpark? Since then Gathr has also added Target as one of the options for $10 credits. Now you can get $10 from Amazon, $10 from Target and another option for $20 total. Personally I like the combination of $10 Amazon, $10 Target and $10 LivingSocial but there are a lot of ways to combine the options. I can treat Amazon and Target basically as good as cash since theres always useful stuff to buy at those merchants. So this deal is basically like getting $10 on LivingSocial for free. The third option has Pandora, several magazine subscriptions and some other services. In my opinion these options have lower value but theres likely something there you can make use of. I would really only recommend doing this is you are sure you can get good value out of the options in question. Also make sure to read the 'details' tab on each offering to see how they work. Some of the credits expire within a month.